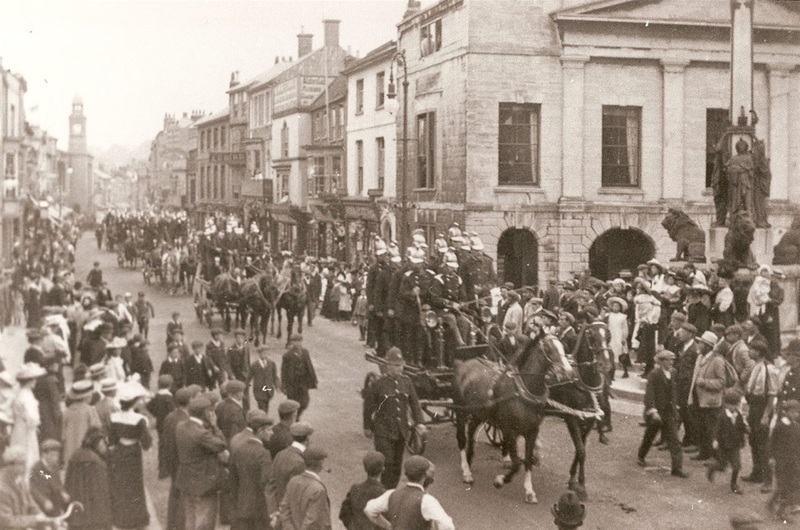 The IWFBF procession heading to Nine Acres field and the annual drill competition of 6 September 1906, the first competition for which F.D. Shields was organiser and honorary secretary of the Federation. Frederick Daniel Shields, honorary secretary of both Newport Volunteer Fire Brigade and the Isle of Wight Fire Brigades Federation, passed away on 4 April 1927 aged 68 years. Frederick was born in Norwich, Norfolk, on 7 September 1858. His parents were Joseph William and Lucy, the former employed as a solicitor-general clerk. Frederick's mother passed away in her 20's and the family, comprising a father and two sons, had relocated to 158 High Street, Newport, by the time of the 1871 Census. 12 year old Frederick was at school while his elder brother Joseph, by one year, was already being tutored in the professional undertakings of their father. Ten years later finds Frederick a married man, to Mary, living at 130 St James's Street and also working as a solicitor general clerk employed by Mr H.R. Hooper. By 1891 the family included six children, two youngest sisters and four brothers including Percival Edgar who many years later was to serve as Newport Fire Brigade's Chief Officer. The County Press reported that in connection with his legal following; he was brought into close contact with the public work of the borough at a most important period of its history, namely that in which, following the typhoid epidemic, was carried through the extensive and costly schemes of water supply and sewerage, which brought the sanitation of the borough thoroughly up-to-date. Frederick's standing rose in the town until he was fulfilling the duties of the Town Clerk. Many other concurrent duties were to follow Frederick who was a staunch Conservative and one who managed notably successful election campaigns for others. By the late-Victorian period Frederick and family were located at 17 Quay Street where he was to spend the rest of his life. In March 1894 Frederick's appeal was extended by the fire brigade to whom he was appointed honorary secretary. From then on his name regularly appeared in that role in local newspapers. It was common for non-firemen members of fire brigades to often muck-in when necessary and it is suspected from contemporary reports that Frederick may have dabbled with a little firefighting during his reign as secretary. One of the notices posted in the County Press by Shields in his role as honorary secretary of the brigade. In 1906 when founder of the IWFBF Charles Langdon retired from the office of Federation secretary, Frederick was invited to fill the vacancy and accepted. He served in this position for just over two years, a modest period but one in which he officiated in the organisation of the thrilling Federation competition of 6 September 1906, attended by Princess Beatrice and at which she presented the Battenburg Challenge Cup, donated by her late-husband Prince Henry in 1895, to the team from Ventnor Fire Brigade who won it in perpetuity with a third victory at the Nine Acres field. In withdrawing from the Federation, and public life in general, Frederick saw his IWFBF role filled by his son Percival Edgar who by then had also taken over the secretaryship of Newport Fire Brigade. After the war, in which Percival was awarded the Military Cross, he stepped from behind the desk and became an operational commander as the brigade's Chief Officer. It would have brought great pride to his father after many years of committed political persuasion and hard work that delivered great improvement to the Newport brigade that had otherwise lagged behind the East Wight brigades for many decades. Despite a gradually worsening health in his later years Frederick was reported to have remained stoic and bright until the end, passing away at home 17 Quay Street during the morning of Monday 4 April 1927. Rest in peace Honorary Secretary Shields.